TRIVIA of Noh : Q111 :Which Japanese films show the influence of Noh? | Home | Trivia | Q111 : Which Japanese films show the influence of Noh? Which Japanese films show the influence of Noh? There are quite a few works by master Japanese film-makers in which you can see the influence of Noh. Kurosawa Akira's works are good examples. His film "The Men Who Tread on the Tiger's Tail" (1945) is derived from the Noh play "Ataka" and the Kabuki play "Kanjinchō". In "Ran" (1985), you can see the influence of short Kyōgen dance in Peter's performance of the Fool. It is "Throne of Blood" (1957) that shows the strongest influence of Noh. The film transposes the plot of Shakespeare's play Macbeth to Japan. Kurosawa introduced Noh techniques of stylistic beauty during the process of adaptation. 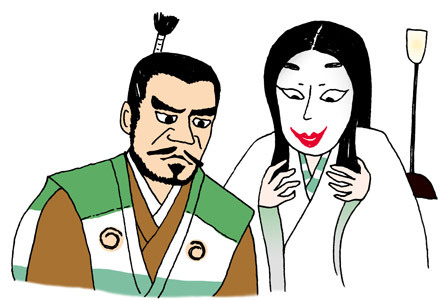 The director asked leading actor Mifune Toshirō to act the character depicted by the Noh mask heida and also required the actress Yamada Isuzu to play the Lady as the character depicted by the mask shakumi. The Lady, wearing a gorgeous brocade kimono that you would see in a Noh play, sits with her knee raised up as if imitating the sitting posture of Noh actors. Furthermore, in the forest spirit scene, you can see an image of "Kurozuka" ("Adachigahara" in the Kanze school). Director Naruse Mikio's film "Uta Andon" (A Song by Lantern Light) is based on Izumi Kyōka's short story of the same title featuring the Noh community. Director Shindō Kaneto created the film "Kanawa" (Iron Trivet), which is obviously influenced by the Noh play of the same title. Thus, it may be said that Noh has inspired many Japanese film directors.